Triennial has ended. This page is left up for reference about Triennial. Enjoy this slideshow from Triennial, June 16-19 2016. Opening Liturgy and Dinner – The Most Rev. Michael Curry, 27th Presiding Bishop and Primate of the Episcopal Church, will be our presider and preacher on Thursday. Throughout his ministry, Presiding Bishop Curry has been active in issues of social justice, speaking out on immigration policy and marriage equality. Presiding Bishop Curry has a national preaching and teaching ministry. His recent books are Songs My Grandma Sang and Crazy Christians: A Call to Follow Jesus. The church is called to participate in God's mission in the world and Deacons are on the forefront of this missional engagement. This workshop develops a biblical framework for this work and offers perspective and strategies for carrying it out. Van Gelder is a Consultant for The Missional Network and Emeritus Professor of Congregational Mission, Luther Seminary. A well-known authority on the missional church, he consults with denominations and congregations in the areas of organizational development and implementing adaptive change processes. This discipline utilizes biblical and theological frameworks in developing a missional approach for helping congregations engage their changing contexts. His most recent book, co-authored with Dwight Zscheile, is The Missional Church in Perspective. Workshop Presenter - The Right Rev. Ian Douglas, Bishop of Connecticut. This workshop will explore biblical and liturgical resources related to our call to God’s mission. Special attention will be paid to the Baptismal Covenant as representing our commission, “co-mission,” in God’s mission. The role and function of the deacon in helping the Body of Christ to discover and live the mission of God in the neighborhood will be a guiding principle of the workshop. Keynote Speaker – Deacon Lori Mills-Curran, Executive Director of the Association for Episcopal Deacons. She will provide an overview of the waves of diaconal theology in mission throughout the history of TEC, and observations concerning the future of diaconal leadership in the missional church. Stephen’s Recognition Liturgy – A Recognition of missional work of our valued colleagues from around the nation: deacons nominated by their dioceses for excellence. Includes a movie presentation. Young adult deacons and young adults exploring the diaconate. An opportunity to connect with a representative of the Church Pension Group with questions about diaconal personal and financial wellness. A session considering Clergy Leadership Formation in Small Congregations, facilitated by a member of TEC’s task force studying these issues. Recognition of Diaconal Ministry in the tradition of St. Stephen. Read. Open Space notes from Triennial available here. Listen to PB Curry's sermon at Triennial. 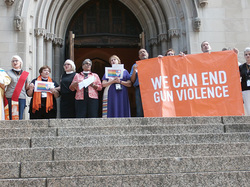 Watch AED's rally against gun violence.